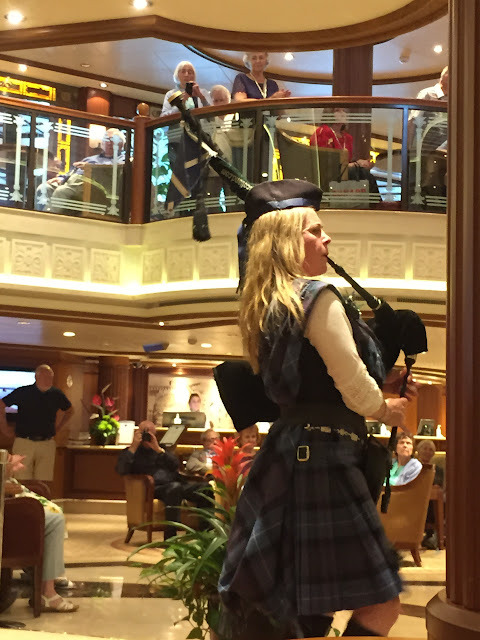 Our very first port of call on our Cunard Cruise around Britain was Edinburgh. Anchored off Newhaven port this would be a tender stop. I had decided not to get off the ship but to stay on board and spend the day with my mum, who did not want to take the tender ashore. My sister and dad were taking an organised excursion to visit the amazing engineering feat of the Falkirk Wheel. From on board the ship we had excellent views of the Forth Bridge, Edinburgh Castle and Arthur's Seat. We were also treated to a performance on board from two Scottish pipers in full costume, they gave an excellent performance in the foyer area of the ship. As you can see from the photos below my mum and I had found an excellent spot. 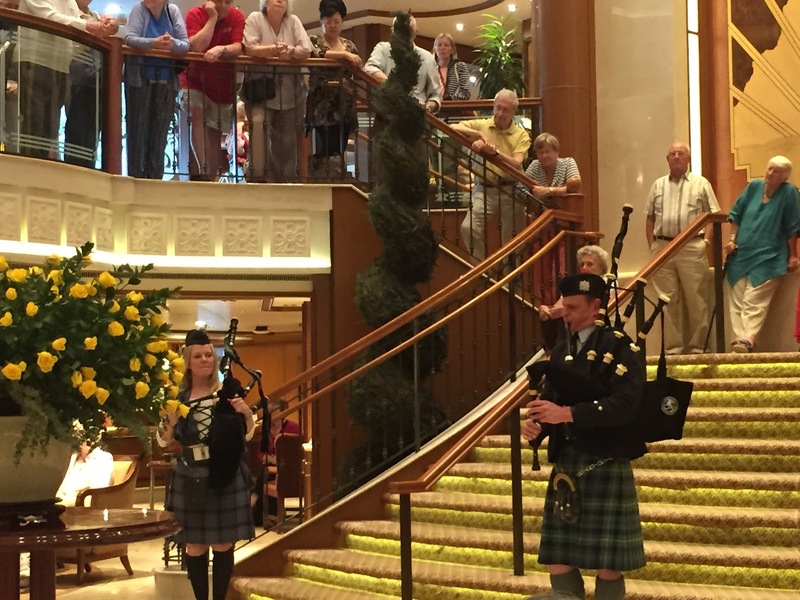 Although we had explored the ship on our first full day at sea the previous day, it was nice to just stroll around at our leisure. Many people had taken the opportunity to visit Edinburgh so it there were fewer people on board, not that it ever felt busy with people. My sister and dad caught the tender service to join their excursion to visit the Falkirk Wheel. Although the excursions were well organised, when it came to transferring from the ship to the port by tender it was a time consuming processes - only so many passengers can fit into the tenders. Preference is given to those booked on excursions. The Falkirk Wheel is a rotating boat lift in Scotland, connecting the Forth and Clyde Canal with the Union Canal. The coach trip included commentary about the local area, a short boat trip along the canal with commentary and history about the Falkirk Wheel whilst on board as you go through the Falkirk Wheel. My sister really enjoyed the excursion and says it was definitely worth while excursion - a marvel of engineering. 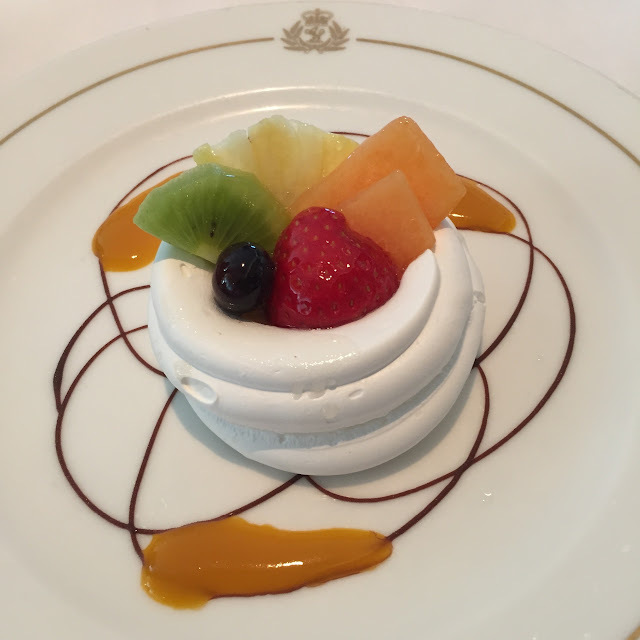 That evening we enjoyed a wonderful meal on board in the formal Britannia restaurant, followed by a light and delicious dessert of meringue with fresh fruit. Miss my first blog post? Read more about my Cruise around Great Britain on board Cunard's Queen Elizabeth cruise ship. The Falkirk Wheel is an amazing feat of engineering isn't it! How great that you got to see it for yourself. 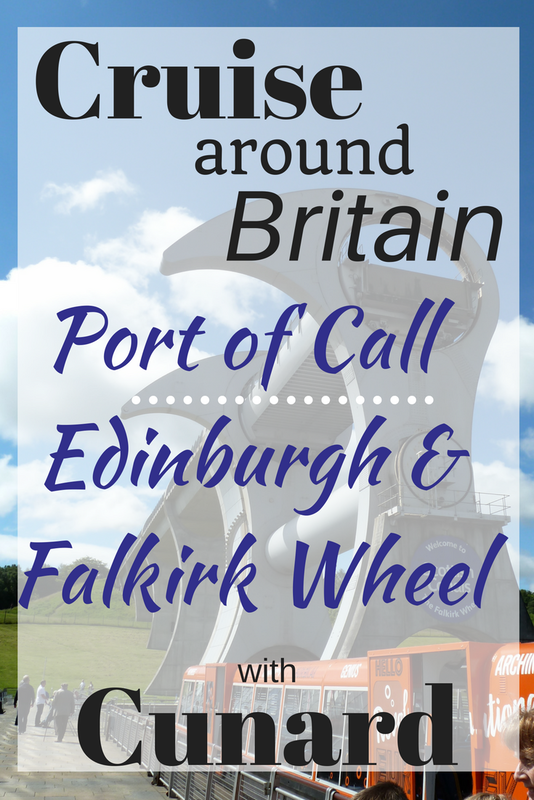 The Falkirk wheel is definitely something that I would like to see. The meringue looks delicious.